God speaks in some amazing ways. The image of a jigsaw puzzle came to me today. At first I dismissed the image. It returned. I was puzzled, (pun intended). That’s when I knew God was speaking and I needed to listen. Experience has taught me to “be still” and listen when thoughts or images return. My tendency is to interrupt God talking. Today was no exception. I had other things to do. Yet I knew, “If you hear me call and open the door, I’ll come right in and sit down to supper with you.” (Msg. Rev. 3:20) So I opened the door and we shared a cup of tea. A revealing and heartwarming conversation developed. I enjoy doing puzzles. I treat myself to a couple each year. I choose puzzles by the picture on the box. Criteria are simple, do I like the picture, and will it be enjoyable to do? My strategy is to place each piece on the table, turn the piece over, and organize the pieces. I begin with the edge pieces; working from the outside in. Relying on the cover picture I get a plan started for putting it all together. I know at the outset of doing a large jigsaw puzzle there will be a gamut of feelings; fun, accomplishment, frustration, curiosity, camaraderie (someone always comes along to assist in finding a few pieces with you). It is the process of doing the puzzle that is enjoyable. When I retired two years ago God gave me a Jigsaw puzzle as a gift. I eagerly opened the box and was excited and enthusiastic about putting it all together. I tried using past strategies that had worked for me before to begin the puzzle. However, this puzzle requires a new approach, an unfamiliar method. This puzzle has no edge pieces, it is boundless and endless. It requires beginning from the inside growing outward. The picture expands as my ability to vision it expands. I have been attracted to certain pieces of the puzzle and that is where God has had me begin; fitting like pieces together, joining like colors and shapes, creating small images. Still true is that I can’t force a piece of the puzzle in where it is not meant to be. I need to put it aside, save it, as a larger image forms I will know where it will be an easy fit. Some pieces are big, some small, some with color, some seemingly black and in spite of not knowing where an individual piece belongs now, I do know each piece fits somewhere in the larger image. The perimeters of separate smaller images are now fitting together creating a larger image even more delightful than the individual smaller ones. The image continues to unfold as long as I am willing and able to add a new piece. God wants me to enjoy the process of doing this “retirement” puzzle. It is a gift. I am working on a new life puzzle with new ways of doing things. He has gifted me with a new picture on the box, one I could not have imagined myself. At the outset of retirement I did not see how the individual pieces would ever fit together. God is inviting me to add new pieces over time, enjoying the progression. I don’t need to figure the puzzle out all at once. God knows the whole picture. It is yet to be seen by me. Young or old, God speaks in our everyday moments. He speaks in the familiar. Today God used an image of something I enjoy to let me know HE is with me, guiding me, creating something beautiful with all the pieces of my life. I am so happy God and I had our chat today. Our talk today over tea has filled my heart with greater peace and contentment. He guides my hand to fit in every piece of the puzzle. 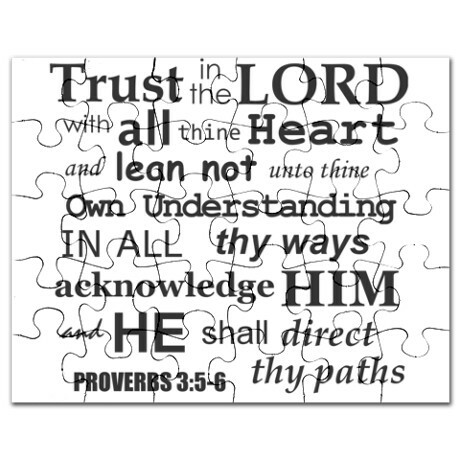 Tags: Emotions, God, Godspeaks, jigsaw puzzles, listen for His voice, Proverbs 3:5, retirement. Bookmark the permalink.